As I had a bit of spare time on Saturday (another rarity) I decided I would get creative with my chicken. When you’re eating chicken virtually every meal, every day, it becomes repetitive and boring and I’m constantly trying to come up with new ideas. 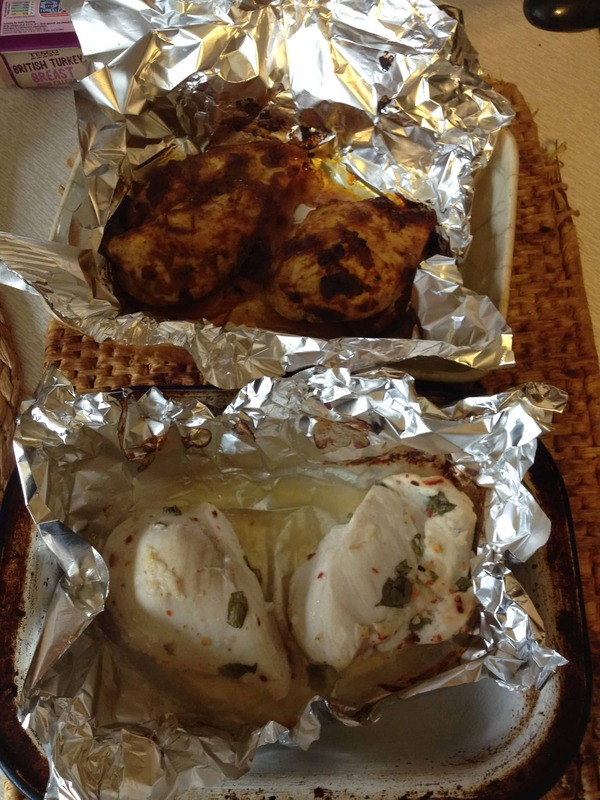 The first two chicken breasts I marinated in a chicken tikka curry paste for several hours, before roasting. The other two were dowsed in a combination of fresh basil, crushed garlic, lemon juice and chilli flakes for a few hours to soak in all the flavours, before roasting. I’ll probably take it in turns to pair these with salads – hoping to chuck in a mixture of bright veg such as peppers to boost my vitamin intakes – and vegetables. I managed to get a good deal on a big bag of kale this week so I’ll probably have that with some of my meals – as well as some of the Brussels sprouts I froze from Christmas time stir fried in some coconut oil. I’m quite lucky in that I’m not fussy about eating things like this cold. Many will shy away from it or wretch at the though of cold sprouts, but I honestly don’t mind them – to me it’s just fuel. I’m also going to try to get back into the routine of four meals a day. When I was doing it before I was losing body fat at a steady rate and never felt hungry between meals – therefore no need to snack. Now I find my stomach growling a few hours after lunch and I end up caving and giving in to naughty treats then feeling guilty over my dinner. I need to get out of this habit – my sugar intake has gone through the roof and I’m hoping to hit the healthy diet and resume training all in one go. Exercising makes me enjoy being healthy – I want to get back to that point where I can’t wait for my next workout. A hard afternoon’s graft and my meals are ready to go! I also picked up a large pack of lean steak mince to help vary the chicken in my diet! 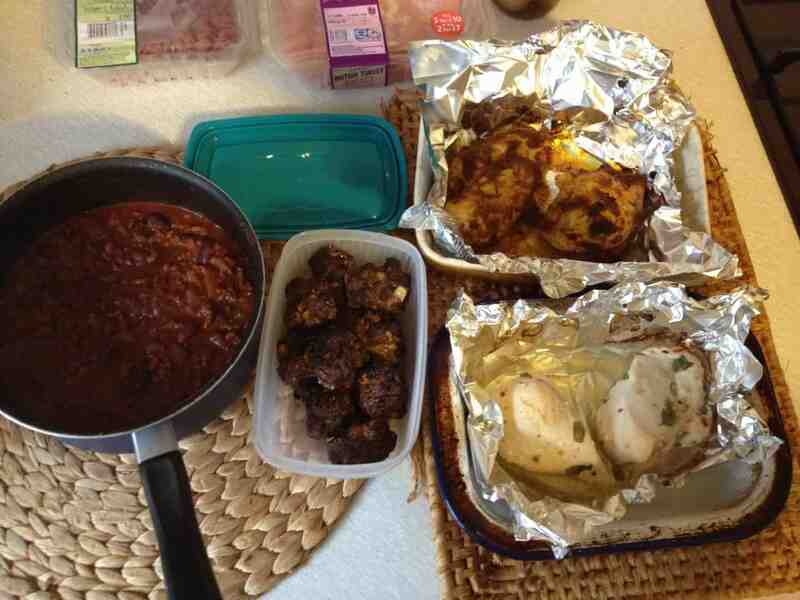 I halved the 750g packet, with half going into meatballs and the other half going into my smoky chilli (recipe here). I varied the recipe a little this time as I found a can of mixed beans in chilli sauce in the cupboard, lurking at the back! I decided to add these in to make it stretch a bit further – beans are a great source of protein and are often a cheap way to beef up the meal and add a good dose of protein to it at the same time. Not bad to give me a lunch for every day of the week and then some! Do you prep your food in advance or do you just make it up as you go along? I’m hoping to post more regular feedback on my health and fitness journey, so any feedback would be appreciated!